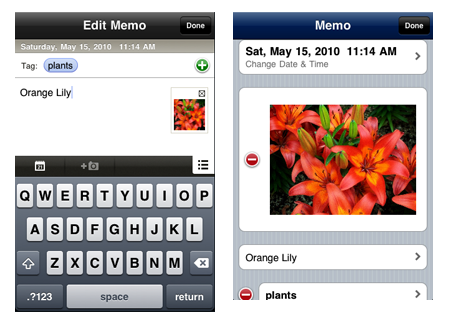 MomoNote: iPhone version of MomoNote v4.1 has been released. iPhone version of MomoNote v4.1 has been released. Have you update to MomoNote v4.1? Continuing with previous v4.0, the v4.1 update contains features like classic design theme, color option for theme, classic editor, and picture memo button. Let’s take a close look at v4.1 update. The ‘Theme’ and ‘Color option’ have been added in ‘Settings’. Currently, supported ‘Theme’ are ‘Basic theme’ and ‘Classic theme’. The Basic theme refers to design offered from v4.0. The Classic theme refers to design prior to v4.0. If you prefer previous MomoNote design, please choose the Classic theme. Only basic and classic theme is available for now, but more designs will be available soon. The color choices for ‘Color option’ will be different for each Basic theme and Classic theme. 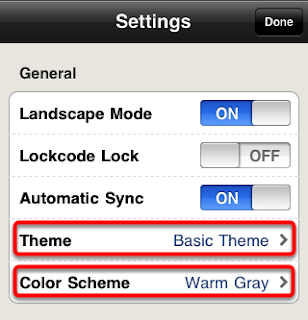 In the Basic theme, Blue, Green, Orange, Pink, and Warm Gray are available. In the Classic theme, Blue, Emerald, Burgundy, Olive, Light Blue, Violet, Black, Orange will be available. The ‘Editor’ has been added in ‘Settings’. You can choose either ‘Quick Editor’ or ‘Classic Editor’ for the editor. 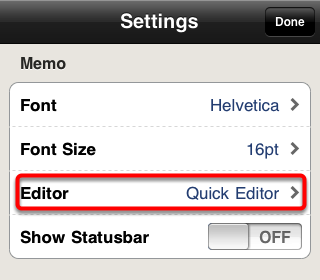 The Quick Editor refers to editing method from v4.0. The Classic Editor refers to editing method prior to v4.0. If you prefer previous editing method, please use the Classic Editor. The ‘Add Memo’ refers to classic text-first memo, and ‘Picture Memo’ refers to a method where you start the memo by attaching the picture first. When you press and hold ‘Add Memo’ button, ‘Picture Memo’ button will appear like the screenshot above. When it appears, touch the button as you drag towards top. The resulting memo will be the same whether you start memo with ‘Add Memo’ or start with ‘Picture Memo’. Just use with your preferences. 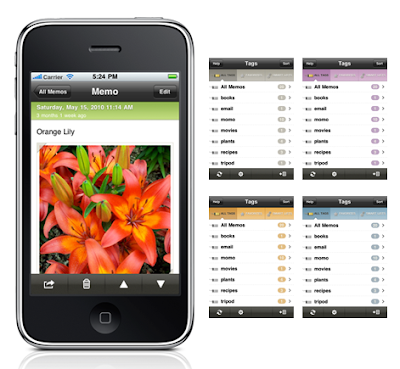 The main focus of this update was to provide various options in theme, color, and editor. Our goal was to satisfy different individual’s preferences and maximizing the user’s efficiency. We will continue to listen to our users’ opinions and put it into actions in future updates. If you have any questions or suggestions, please visit our Twitter, Blog, and e-mail and let us know. We will continue to use this Blog to notify our users with variety of information and news. Keep us posted and thank you for your interests. This is a really great blog! I always use the memos on my phone as reminders! I don't know what I would do without my phone - it broke the other week and I had to get it fixed ASAP using Cell Phone Repair Pros. Features Of Gamecih.Apk Steps To Install GameCIH APK.